The Coalition to Save Hempstead Harbor was formed in 1986 in response to reports of continued degradation of Hempstead Harbor due to contamination from toxic waste sites, emissions from a local incinerator and other sources, and sewage discharges. CSHH joined with other community members and successfully prevented a new incinerator from being built on the harbor’s western shore and shut down a failing incinerator that was operating on its eastern shore. CSHH sponsored the development of a townwide recycling plan for the Town of North Hempstead, offering a solution to problems of solid-waste management, and became a critical watchdog for the harbor, pressing local government and agency officials to shut down polluting businesses and accelerate the formulation of remediation plans and the cleanup of toxic waste sites around the harbor. Through community organizing and legal challenges, CSHH has, for example, prevented the inappropriate development of a big box supermarket on Roslyn Village’s waterfront and assured that the original Sea Isle development plan was significantly diminished. The following sections highlight CSHH’s activities, accomplishments, and ongoing efforts. CSHH developed a citizens water-monitoring program for Hempstead Harbor in 1992. The motivating factors for this effort were the chronic sewage spills from failing wastewater-treatment plants that were sited along Hempstead Harbor and the drastic cutbacks to Nassau County Department of Health’s water-quality monitoring program. CSHH’s monitoring program was intended as a springboard for public education and outreach−to foster increased awareness of environmental issues and encourage public participation in local conservation efforts. By 1998, improvements in water quality around the harbor were noticeable, and CSHH initiated a hard-clam density survey, working with local baymen, the Town of North Hempstead, and NYS Department of Environmental Conservation (DEC). The results of the survey were promising and set the stage for the work that would begin eight years later to start the stringent water-quality testing necessary to determine whether the harbor’s shellfish beds could be reopened for harvesting. CSHH worked hard to develop a credible water-testing program that could be relied on to indicate the health of the harbor. However, the primary purpose in establishing the program was to encourage all who live, work, and enjoy recreational activities around Hempstead Harbor to renew their interest in the harbor, as well as in Long Island Sound, and to participate in restoration efforts. An important component of the program since its start has been to involve citizens in observing changing conditions around the harbor and notifying CSHH as well as appropriate municipal and environmental agencies of any unusual events affecting the harbor. Over the years, the scope of the water-monitoring program has expanded, as has the network of partners that have supported it. In 1995, as CSHH continued its monitoring efforts, the nine municipalities that share jurisdiction over Hempstead Harbor formed the Hempstead Harbor Protection Committee—a municipal partnership—to address the harbor’s water-quality problems using a watershed-management approach. CSHH became the first environmental organization to join the committee—as a nonvoting member and technical adviser. In 2006, the Hempstead Harbor Protection Committee was able to assume financial responsibility for the water-monitoring program through a grant from the National Fish and Wildlife Foundation while the Coalition to Save Hempstead Harbor continues to coordinate and implement the program. The Coalition to Save Hempstead Harbor and the Hempstead Harbor Protection Committee continue to work closely together on improving Hempstead Harbor’s water quality. The two organizations illustrate the great successes that can result from creating valuable partnerships that pool resources and maximize results to benefit the environment and local communities. By 2006, NYS DEC had begun the water-quality testing necessary to determine whether a portion of the outer harbor could be recertified for shellfish harvesting. Over the next several years, CSHH worked with local municipalities and environmental agencies in shellfish-seeding programs for the harbor and expanded the citizens monitoring program to support the goal of reopening shellfish beds in Hempstead Harbor. After five years of rigorous testing of water samples as well as samples of hard-shell clams from Hempstead Harbor, NYS DEC and NYS Department of Health determined that 2,500 acres of the outer portion of the harbor could be reopened for shellfish harvesting year-round. June 1, 2011, was the opening day for the recertified shellfish beds. For the first time in more than 40 years, commercial and recreational clammers could take shellfish from Hempstead Harbor. Over the years, CSHH has served on various policy and planning committees, such as the master-plan committees for Nassau County and the City of Glen Cove as well as review committees for the Scudder’s Pond Restoration Plan, the Glenwood Road/Powerhouse Drain Stormwater Pollution Abatement Plan, and, most recently (in 2014), the Town of Oyster Bay Local Waterfront Revitalization Plan. In 2009, CSHH initiated a work group of local community organizations to focus on development of a townwide land-preservation plan. The work group considered various land-use planning vehicles along with a proposal to review the Town of Oyster Bay’s Groundwater and Open Space Protection Plan (2006) in light of current local land-use and harbor-preservation efforts. A first step toward a broader land-use preservation plan is to determine the feasibility of a watershed-protection overlay district for Hempstead Harbor. The scope of the Glenwood Road/Powerhouse Drain Stormwater Pollution Abatement Plan (completed for the Hempstead Harbor Protection Committee in December 2013) was expanded to include this element. At the same time that CSHH developed the water-quality monitoring program for Hempstead Harbor, concerns about the health of Long Island Sound gained increased attention. CSHH participated not only in the meetings and hearings that led to the completion of the Long Island Sound Study’s Comprehensive Conservation and Management Plan, but also to the planning and review meetings for the update to the management plan, which will be completed in 2015. CSHH has been a member of the Long Island Sound Study’s Citizens Advisory Committee since 1992 and served for three years as chair of its Communications Subcommittee. In 2009, CSHH became a member of the newly formed Long Island Sound/New York State Sentinel Site Work Group, which was charged with addressing climate change and ways to measure the impacts on Long Island Sound. (This was part of a bi-state—New York and Connecticut—approach to understanding climate-change indicators for Long Island Sound and selecting appropriate sites to measure them. In 2011, the Sentinel Monitoring for Climate Change in the Long Island Sound Estuarine and Coastal Ecosystems of New York and Connecticut was completed. In 2002, CSHH was asked by the EPA Long Island Sound Study Office to plan and coordinate a Stormwater Workshop to help prepare Long Island communities to meet the requirements of the EPA Phase II Stormwater Regulations. CSHH received a grant to host the workshop, which was cosponsored by the EPA Long Island Sound Office, Long Island Sound Study, and the New York Sea Grant Program. In 1996, CSHH initiated the creation of the Water-Monitoring Work Group, a soundwide network of environmental agencies and nonprofits connected with water-monitoring programs around Long Island Sound. The work group provided a forum for reviewing current testing parameters and for examining testing results in a broader context. Among the work group’s achievements was completion of the Long Island Sound Mapping Project (July 1998), which mapped sites monitored around Long Island Sound and identified the agencies and organizations responsible for testing. The project was funded through a grant awarded to CSHH, on behalf of the work group, by EPA/Long Island Sound Study. CSHH continues to work with other environmental groups and agencies around Hempstead Harbor and Long Island Sound. For example, in November 2011, CSHH helped to scope out the density of blue mussels at a site in Hempstead Harbor that had been used as part of Long Island Sound portion of the National Status and Trends Mussel Watch program since 1986 (a project sponsored by the National Oceanic and Atmospheric Administration (NOAA)). In March 2012, CSHH was asked to scope out the density of ribbed mussels in Hempstead Harbor as part of another NOAA project. In 2013, CSHH was asked to participate in developing a report-card system of communicating the health of Hempstead Harbor’s water quality. Since 2014, CSHH, along with the Hempstead Harbor Protection Committee, has been working with marine scientists from the University of Maryland, under a grant from the Long Island Sound Study’s Futures Fund. The report card, which is based on 2013 water-monitoring data, will be released in June 2015 along with a report card for Norwalk Harbor in Connecticut and Long Island Sound. The Coalition coordinates annual local beach cleanups as part of the International Coastal Cleanup. This has been an ongoing activity since 1992. In April 2011, CSHH organized an emergency cleanup of plastic disks that were accidentally released from an aeration tank at the Mamaroneck sewage treatment plant. The cleanup resulted in the collection of over 27,000 disks from five beaches around Hempstead Harbor and helped convinced Westchester County to send crews to continue cleanup efforts. The emergency disk cleanup inspired two local artists to create marine creatures and seascapes from the disks. 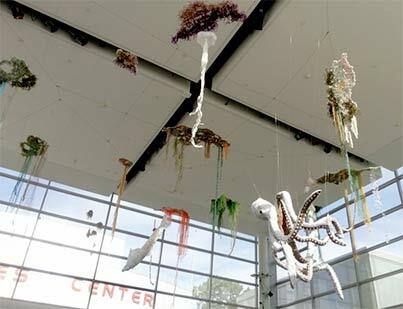 These were featured in several exhibits, including one at Tilles Center, which opened in September 2013. See also our June 2, 2011, HarborNews. Throughout the rest of the season, disks continued to wash up on Hempstead Harbor beaches as well as along the shores of other bays around Long Island Sound. In 2000, CSHH became a partner in EPA’s Environmental Monitoring for Public Awareness and Community Tracking (EMPACT) program. CSHH worked with the Marine Sciences Department of the University of Connecticut to maintain a telemetry link at the EMPACT Web site at www.MYSound.uconn.edu, so that water-quality data from Hempstead Harbor could be viewed on the Web. The Town of Oyster Bay became an important partner in this project, having contributed the stationary probe and use of a boat and staff to assist with probe maintenance. In 2005, logistical problems and lack of funding to purchase and maintain necessary new equipment prevented the continuation of this program. 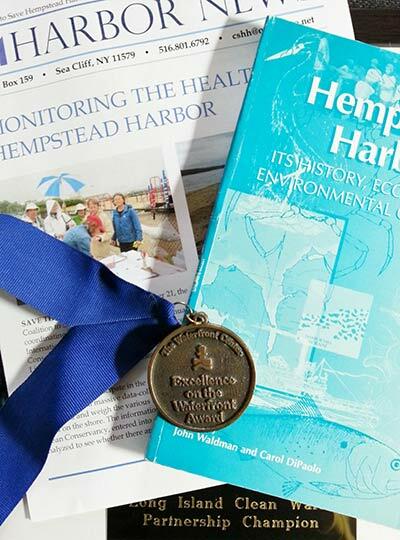 In 1998, CSHH published Hempstead Harbor: Its History, Ecology, and Environmental Challenges. The book supports the goals of the water-monitoring program in encouraging community members to learn about Hempstead Harbor as an important habitat for marine life and other species. It also describes the critical relationship between the ecology of the harbor and sound and the quality of life (as well as the economy) of surrounding communities. In 2001, CSHH received the prestigious Clearwater Award, announced by The Waterfront Center, a Washington, DC-based educational organization with worldwide membership. CSHH was commended for the scope of its activities in working to improve conditions in and around Hempstead Harbor. Particularly noted were CSHH’s book and the expansion of its water-monitoring program.